Many farmers have considered including peas with small grains used as a cover crop for establishing alfalfa or as an emergency silage crop. The resulting silage is more palatable and higher in quality than small grain silage. The following information summarizes research regarding the influence of variety selection, seeding rate and mixture proportion. What are the seeding choices? Barley and oat varieties have had the same average yields in UW trials, both alone and in mixture with peas. Shorter, earlier heading varieties have lower forage yields and higher forage quality. Shorter, earlier heading varieties are less hard on any alfalfa seedlings underneath. Thus, varietal selection, not species selection, has the greatest effect on yield. Triticale has about the same average yield with taller, later maturing varieties yielding more than early, shorter varieties. The data (in table 1) show that adding peas to oats improved forage quality by increasing protein content 3 to 5 points and reducing NDF by 4 to 8 points. Adding peas to barley increased protein 2 to 4 points and reduced NDF by 5 to 9 points. Similar responses would be expected with peas added to spring triticale. Unless nitrogen is limiting, adding peas to small grains will have minimal effect on total forage yield. Therefore the only reasons for adding peas are to improve small grain silage forage quality and palatability. This year many pea varieties are not in great supply. An alternative is to use leafless or semi-leafless peas along with the small grain. Studies have shown that leafless or semi-leafless peas have similar quality effects as standard pea varieties. What forage quality can be expected? If oats are harvested at the late boot stage (less than 1% heads emerged) the digestible fiber can be expected to be 70% and 60% NDF. This gives a relative forage quality (RFQ) of about 100. Adding peas at rates mentioned below will result in a RFQ of about 125. This higher quality, along with improved intake due to better palatability, can truly make small grain/pea mixtures a dairy quality forage. What is the recommended seeding rate for pea/small grain mixtures? 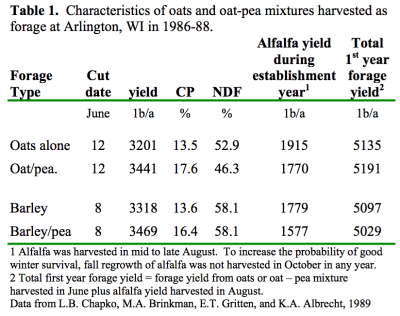 Studies conducted at the University of Wisconsin Arlington Research Station comparing different oat and barley mixtures with peas during 1986 to 1988 showed that planting the small grain at 20 seeds/sq ft (about 2 bu/a) produced maximum forage yield. Including Trapper peas at seeding rates up to 100 lb/a increased forage quality. However, diminishing returns and cost of peas suggest that the optimum seeding rate is 50 lb Trapper peas per acre. 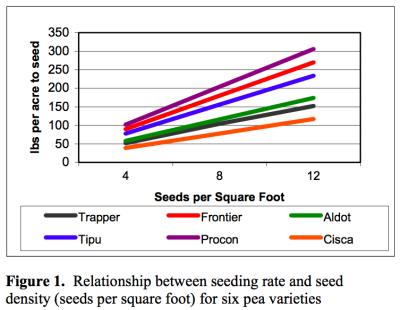 Therefore, recommended seeding rate for small grain/pea mixtures for optimum yield and quality is for 10-15 oat seeds /sq ft (30 to 45 lbs./a) and 4 pea seeds/sq ft. (Pea size varies considerably and more pounds of most other pea varieties should be seeded because they have larger seed size – see Fig 1). Similar rates are recommended for barley and triticale mixtures with peas. The final seeding rates selected should be adjusted down if moisture may be limiting and seed cost is higher. Including more peas than recommended increases the cost of the seed mix, increases lodging, and slows drying rate of the resulting silage or hay with little additional quality benefit. Can alfalfa be seeded with small grain – pea mixtures? Peas can get both Phytophthora and Aphanomyces root rots. However, growing peas as a cover crop for alfalfa will not increase the incidence of either disease in the alfalfa seeded underneath. Peas should not be seeded alone on top of alfalfa because of the potential for lodging and smothering the alfalfa seedlings underneath. Likewise, small grain and pea mixtures should be harvested if any lodging occurs in an effort to save the alfalfa underneath. What is the best time to harvest small grain and pea mixtures? Small grain pea mixtures should be harvested based on the maturity stage of the small grain. These mixtures should be harvested at the late boot stage (few heads showing) for lactating dairy cows and the soft dough stage for heifers, dry cows, and beef cattle. Harvesting at late boot will generally result in forage that is about 125 to 130 RFQ and harvesting at the soft dough stage will increase tonnage and result in a forage that is about 100 to 110 RFQ which is adequate for heifers, dry cows and beef cattle.